We all know the old saying: "You are what you eat". I'd like to change it a little to "You feel like what you eat." 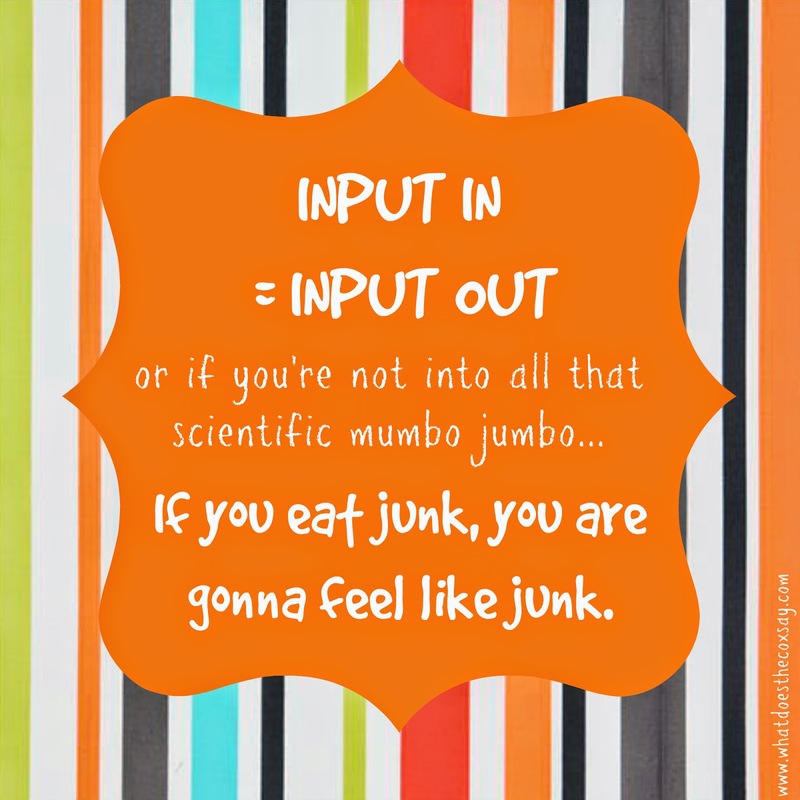 Just to make fun of myself a little, I'm pretty sure "input out" could simply be "output" and "input in" could simply be "input". Clearly I'm not a scientific type either! :) But you get the idea! I feel so cruddy when I eat junk food. My mood is off, I have zero energy and it all just goes down hill from there. On Monday I started a 6 Weeks to Summer Challenge! There's still time to sign up if you're interested! I loved that it encourages you to make healthy changes. It's a two part challenge. So far since my first weight in I'm back down 4 pounds. I love the extra motivation, it really is a great! If you have any questions about the challenge. Let me know and I'll get you more info. I love that as long as you reach your goal, you get a piece of the winners pot. Such an awesome idea. That's all for me this week. Thanks for stopping by and listening!